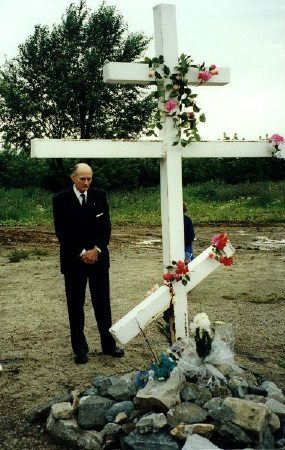 Prince Nicholas Romanovich, Head of the Romanov Family, had arrived at St Petersburg a few days before the official ceremonies, whereas his younger brother, Prince Dimitri Romanovich, flew to the western Siberian town of Ekaterinburg to represent the family during a two day program of intense and solemn ceremonies prior to the departure of the coffins for the old Imperial Capital. "It was early in the morning and still dark on 14 July 1998 when Dorrit, my wife, and I left our house north of Copenhagen, reaching the airport just as the first rays of sun were beginning to illuminate a cloudless sky. At the gate it was time to say good-bye, my wife was destined for St Petersburg by direct flight. She would join my brother Nicholas and the many close and distant relatives who had already begun arriving in the former Imperial heart of Russia. I was to fly to the western Siberian town of Ekaterinburg to be present there as representative of the Romanov Family for ceremonies both civil and religious which would finally see the transfer to St Petersburg of the remains of the Tsar, his family those of Doctor Botkin and the three faithful servants who had shared their fate. Interviews greeted me on my first evening and the following morning, the 15th, I was asked by a representative of the town's administration to visit some significant sights accompanied by a television-crew. Modern Ekaterinburg had become an important industrial town, producing military hardware while in recent years it had begun a diversification into manufactured goods for the home market. International brand names and local banks were well advertised and it seemed that people, shops, cars were not much different from those to be seen in St Petersburg. After speeding through the center of Ekaterinburg by broad road, the driver of our Volga stopped close to the entrance of what looked to be no more than a parking lot. Followed by the representative of the Governor's staff and television crew, we entered the site where the Ipatiev house once stood. There was not much to be seen, except for a flimsy wooden construction and a three meter tall metal cross painted white having some rather large stones piled at its base. Approaching it I could see that twisted around the cross were some plastic roses and leaves. A bridal bouquet and some flowers had been laid on top of the stones. I felt deeply uncomfortable and in a way unprepared for what I was seeing, but I forced myself to think only about one thing, which was that I was standing on the spot where once stood the Ipatiev House in whose cellar 80 years earlier a terrible crime had taken place. An elderly woman was kneeling by the cross deep in prayer. I stood there in silence waiting assuming that she would finish her worship. Minutes passed and knowing that we had a long schedule ahead of us, I approached the cross and knelt beside her. While I was praying I noticed that one of the small candles that she had placed between the stones had tumbled. I reached for it intending to place it more firmly between the stones. Suddenly the woman said quietly to me that it was better to move it to the left so that its flame would be better protected, which I did. Seconds after she was again deep in her prayers and so was I.
I got up and stood silently in front of the cross. The woman rose standing close to me still deep in her meditations. One of the persons in our group approached us and, to my displeasure, announced me. For the first time the woman looked at me and stared in disbelief. She suddenly said in a loud firm voice: "It is a miracle!" It was my turn to stare at her. She repeated once more the phrase adding this time: "Here I am praying for the slain Imperial Family, and who kneels and prays together with me? A member of the Imperial Family!.. It is a miracle indeed!" She then started quietly crying and put her head on my chest. I embraced her holding her head even closer to me. We stood like that for a while in a marvelous communion of tears and powerful feelings. 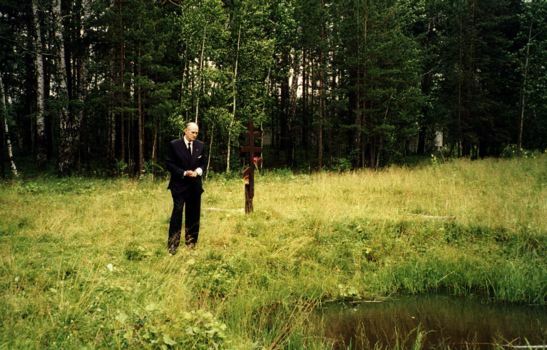 Our next stop was to be the site were the bodies of the victims of the Ipatiev House had been secretly buried 80 years earlier, by the Koptyaki road, 12 miles to the north-west of Ekaterinburg. It took a long time to reach, our driver had first taken a wrong road. Arriving finally to the forest through which the Koptyaki road used to pass, and leaving our car we walked for less than 5 minutes through a marshy, uneven path reaching finally a small clearing at which was a wide oblong hole filled with water. A few paces from it stood a rusty iron cross adorned with a few flowers. This was the moment I dreaded most. I do not wish to describe either my feelings or the thoughts that rushed through my mind during those dreadful minutes at that desolate site on the former Koptyaki road. I wish only to say that I will always remember them as the most difficult moment of my life. We were late, so we drove as fast as it was permitted to our next scheduled stop, it was the Ekaterinburg Forensic Institute building, where the remains of the victims of Ipatiev House had been laying for almost seven years. We rushed to the great hall where the ceremony of the transfer into coffins of the earthly remains of the Imperial Family, of Doctor Botkin and the three servants was about to take place. My first impression was a feeling of awe and shock as I tried hard to comprehend the incredible scene that presenting itself before my eyes. Close to the outer wall of the long and rather narrow hall stood rigidly at attention nine soldiers in parade uniforms holding their rifles with fixed bayonets. 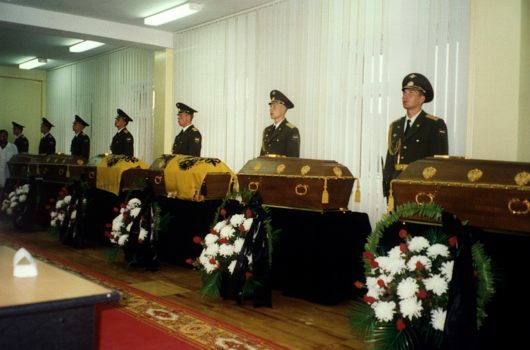 Placed high at their sides were displayed, protected by a plexiglass cover, the remains of the victims massacred in the cellar of Ipatiev House. Many of the brownish colored skeletal remains showed missing bones or partly destroyed craniums. A step lower were the caskets with open lids decorated with Imperial eagles into which the remains were to be deposited during the ceremony. One of the many thoughts that rapidly passed my mind was that fate had decided that I would not only be the first, but also the last member of the Romanov Family who would see, before their caskets would be forever closed and sealed, the earthly remains of Emperor Nicholas II, Empress Alexandra, Grand Duchesses Olga, Tatiana and Anastasia and those of Doctor Botkin and the three faithful servants. The transfer of the remains was executed with painstaking precision, each casket was blessed by the attending priest, then closed and sealed. I believe it took close to an hour and half to complete it, after which the special commission filled and signed the protocol and the judicial part of the ceremony was thus also completed. Utterly exhausted, I returned to my hotel. Early on the morning of 16th July, I left the hotel and was driven back to the Forensic Institute to take part in the transfer of the nine caskets to the Ascension of Christ Cathedral in central Ekaterinburg. After a lengthy religious ceremony had been completed, the organisers allowed the public to pass through the church and pay their last respects to the deceased. Standing alone as representative of the Romanoff Family and facing them rather close, I could clearly follow the reactions of the people passing in front of me. When they suddenly were confronted by the scene of the many coffins decorated with the two-headed eagle, and the ones of the Emperor and Empress covered with the bright yellow Imperial Standard, most of them stopped in their tracks, some just rapidly crossing themselves, some just gaping in disbelief while many elderly women fell on their knees, bowing their heads and crossing themselves. Seeing me several of them guessed or understood that I was representing the Imperial Family and they either respectfully bowed their heads towards me or said in a loud voice: "Do forgive us!" The security service had to coax them all the time to continue to circulate so as to give a chance to the many hundred people still waiting to pay their respects. Departure of the remains being scheduled at 12 o'clock sharp, the organisers had no choice than to interrupt the flow of people still queuing to pay their last respects. I stood some 15 minutes outside the cathedral in that warm sunny day with the local authorities and the officials that were soon to board the plane for St Petersburg. Punctually at noon the cathedral's bells started ringing, the main doors of the cathedral were flung open and the first casket was taken out born by four slowly marching soldiers. Precisely at that moment large drops of rain started falling, soon followed by a downpour. I heard somebody saying: "Even nature is crying!" After the last casket was taken out and deposited with the remaining ones into nine awaiting vans we climbed, soaking wet, into the cars of the funeral procession. Twenty minutes later we arrived at the airport were the caskets were transferred to the giant cargo plane through its gaping back door. Later I climbed aboard and saw in the empty, cavernous cargo space the nine caskets already securely fastened to the floor. After a short talk with the crew of the plane I descended and walked back to the authorities who were standing to see the plane depart for St Petersburg. It had ceased to rain but we heard one single loud thunderclap - somebody remarked: "A fitting farewell salute to the martyrs!" After the cargo plane left we boarded the passenger plane which was to transport us to the former capital of Russia. For the first time since I had landed in Ekaterinburg I felt deep inside me that a very heavy weight had been lifted from my shoulders and that soon I would be embracing my wife, my brother and the many members of the family awaiting the two planes at Pulkovo airport of St Petersburg." Rungsted Kyst, Denmark, August 1998.